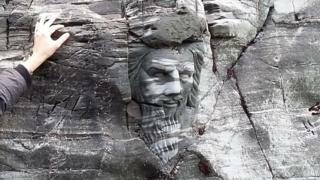 A rock carving of Merlin at a coastal cave reputedly linked to the legend of King Arthur has been branded a "Disneyfication" of the site. English Heritage, which commissioned the artwork, has been accused of "commercialising" Tintagel Castle, the legendary birthplace of King Arthur. Cornwall councillor Bert Biscoe has written to the charity to complain about the "comic-book face". It said the carving would help visitors understand the history of the site. The work sits at the mouth of the so-called Merlin's Cave, where, according to legend, the wizard took Arthur as a baby to keep him safe. In his letter, independent councillor Mr Biscoe also complained about a proposed 8ft (2.45m) model of an Arthurian knight which is set to be bolted into rocks near the castle. "This is one of the most heavily designated pieces of landscape and archaeology in Britain," he said. "If we start carving comic book characters into the geology, where do we stop? This is not Disneyland, it's Cornwall." The carving was finished in February by local craftsman Peter Graham who described the work as "a temporary intervention" which would be eroded by the weather. Mr Graham hoped the carving would spark people's imaginations and said he had received "overwhelming support" from visitors to the site. English Heritage said plans for its "outdoor interpretation scheme" received planning permission last year, and include plans for "several artistic installations inspired by the legends of Merlin, King Arthur and Tristan and Iseult". "These legends have all had a profound impact on shaping Tintagel, and will help visitors to understand how the site grew and developed over the centuries," it said.